Birmingham New Street is the right place to begin your expedition around the city. It is one of Birmingham's principal thoroughfares with several attractions in and around the street. The Street houses one of the oldest and main railway stations opened in 1854. Birmingham New Street also boasts of Victoria Square, which houses the Town Hall and the Council House, the Birmingham Museum and Art Gallery. You can also find the Centenary Square, Repertory Theatre and the acclaimed Birmingham Symphony Hall further west of the New Street. Don't forget to visit the city's main shopping centres and markets. Do not miss the Pallasades, the Pavilions and the famous Bull Rings further south of Birmingham New Street. Birmingham New Street Station is located on New Street. It is the City's main railway station and is a major hub of the British Railway System. The Birmingham New Street Station is a central location and railway lines from all over the United Kingdom run into it including railway lines to London, Manchester, Scotland, Wales, Bristol, Penzance, Nottingham, Leicester, Shrewsbury and Newcastle. Currently it handles about 80% of the daily services to Birmingham including long distance trains from Euston to the north, services from the south and the south-west to Scotland, Newcastle and the east-west services to East Anglia and through Central Wales. The station serves over 31 million people every year. 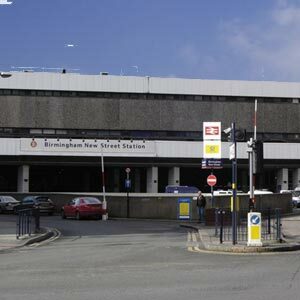 The Birmingham New Street Station is also a terminus for many local train services from throughout the West Midland Conurbation. Meanwhile it is also the main station on the Local Cross City railway line servicing Lichfield, Redditch and other stations in between. This station is managed by Network Rail along with 16 other stations of England.